Let's Face it Friday - Creepy Cute! 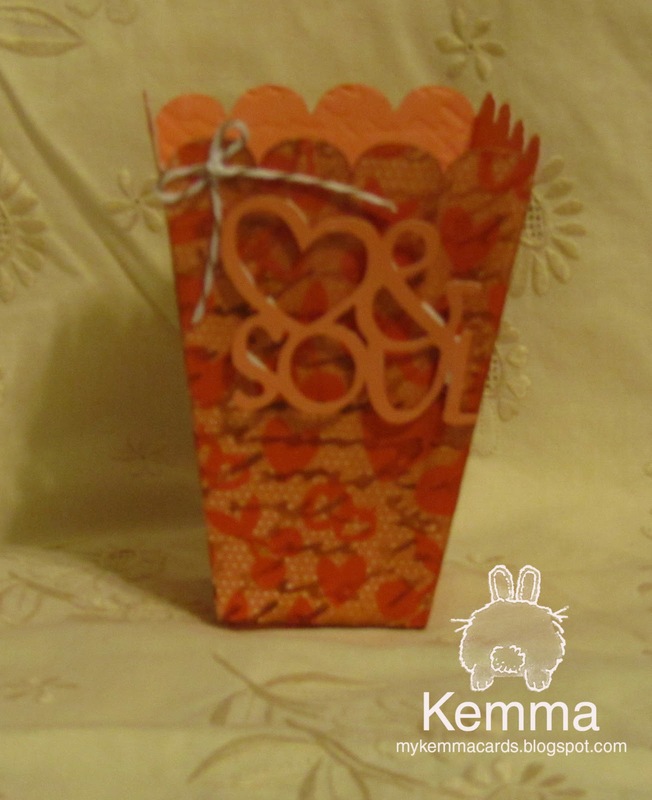 I went to my one and only local scrapbook store, Archiver's, and they did a make and take of a little luminary. So I decided I wanted to try some at home. Well, I didnt want to buy that face punch and tried to hand cut out the face with an exacto knife, well, I didnt like that at all. So I decided to use the little things I mad and redo them with some fun little Peachy faces! is the basic luminary pattern, without the punch. 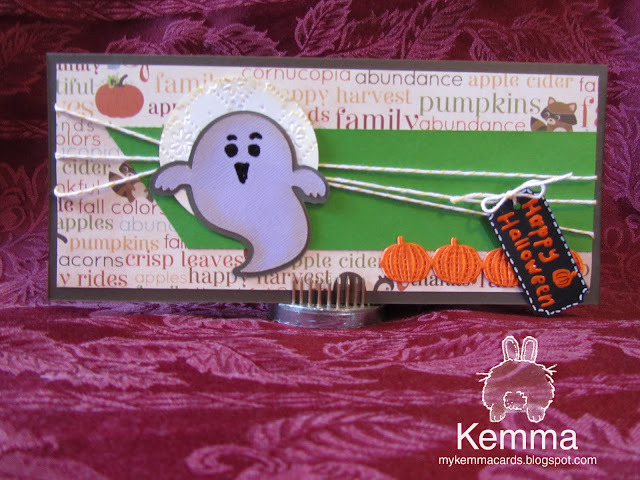 The little ghost is from one of the paper dolls Cricut Carts, and the bat is from Doodlecharms. I distressed them with Ranger distress ink, tried forest moss on the bat and orange marmalade on the ghost. I used Peachy Keen faces for both. Added some sparkle with my sparkle gell roll pen. I did not have any neat little sentiment stamps for halloween, so I printed out these on the computer then punched them. Added some ribbon to one and then twine for the other. They can be filled with candy for a nice little treat! And at first I wasn't feeling it, but as I started to draw out my ideas, I ended up with three different cards that I made. Only one can be posted lol. 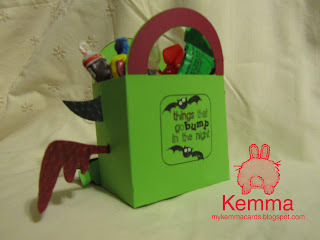 I have to look up the other carts when Cricut Craft Room is back up, sorry I forgot. We are so excited about our new sketch section in the Circle Magazine that we want to get you in on the action! Use this month’s sketch on page 9 and 10 of the October Issue to create your own masterpiece. 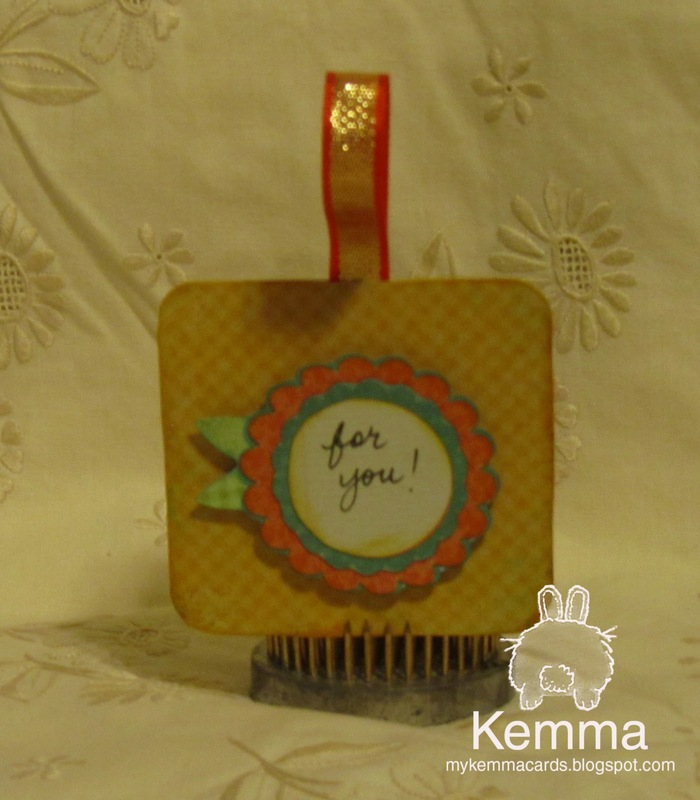 It can be a card, layout, decor item, or whatever you are inspired to create. 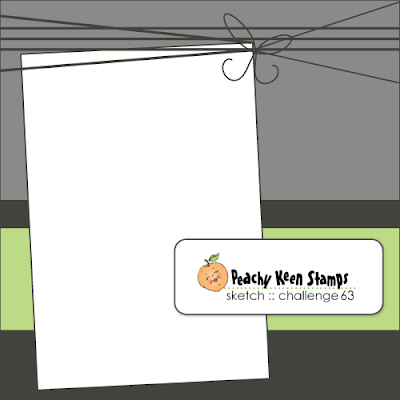 Contest Rules: Use this month’s sketch and at least 3 Cricut cuts to create your project. Contest will open on October 22nd. 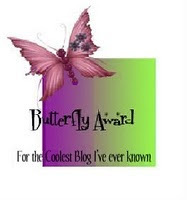 Please upload a working link or picture of your project to the blog under the Magazine Challenge tab. Please, one entry per person. Entry deadline is Friday, November 11th. 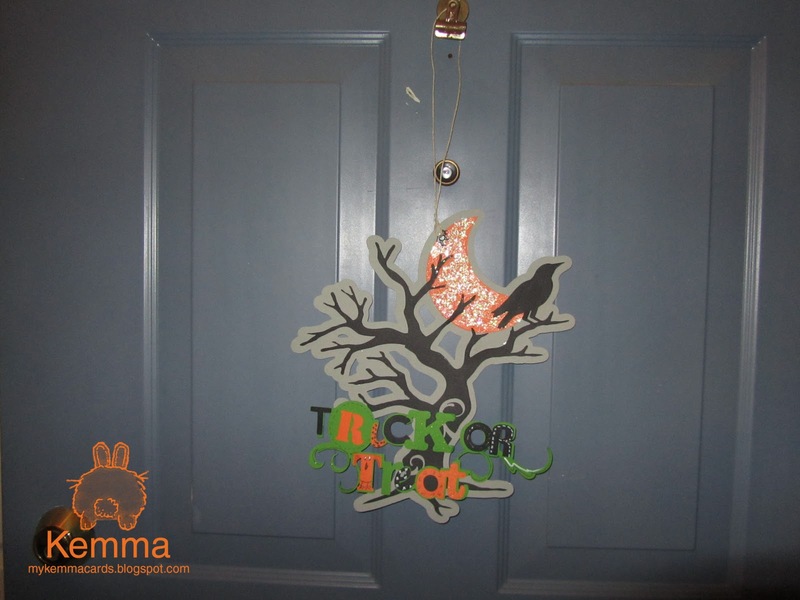 The winner of this contest will receive $150.00 credit to Cricut.com! Please check out my entry at the below URL and leave a comment THERE to vote for me! Hello everyone!! Today I would like to showcase the Cricut Cartridge Mini Monsters. I have really enjoyed this cartridge and have already made several projects with it. 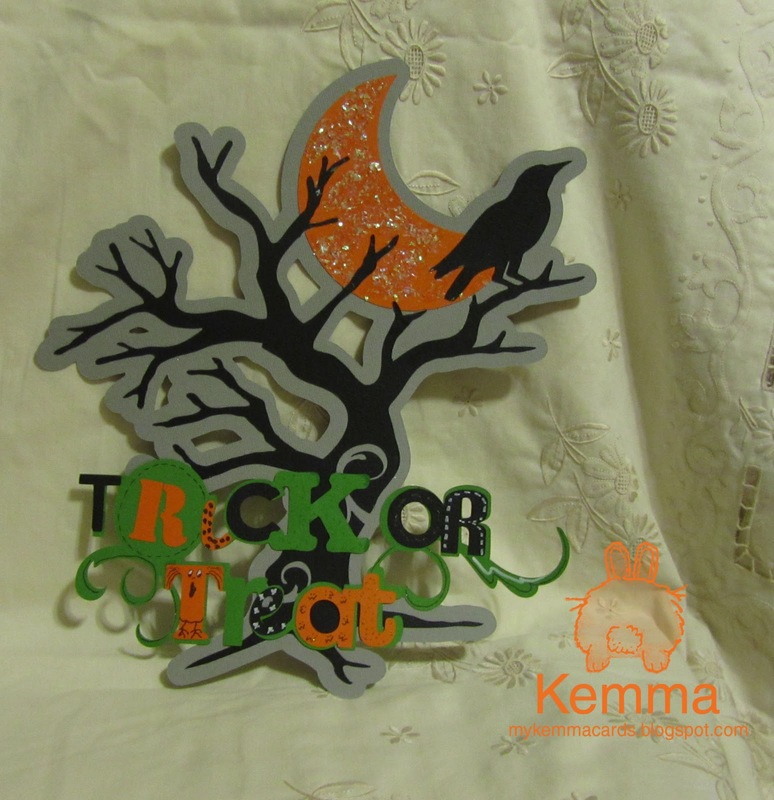 Some of them include a halloween card that I have made. 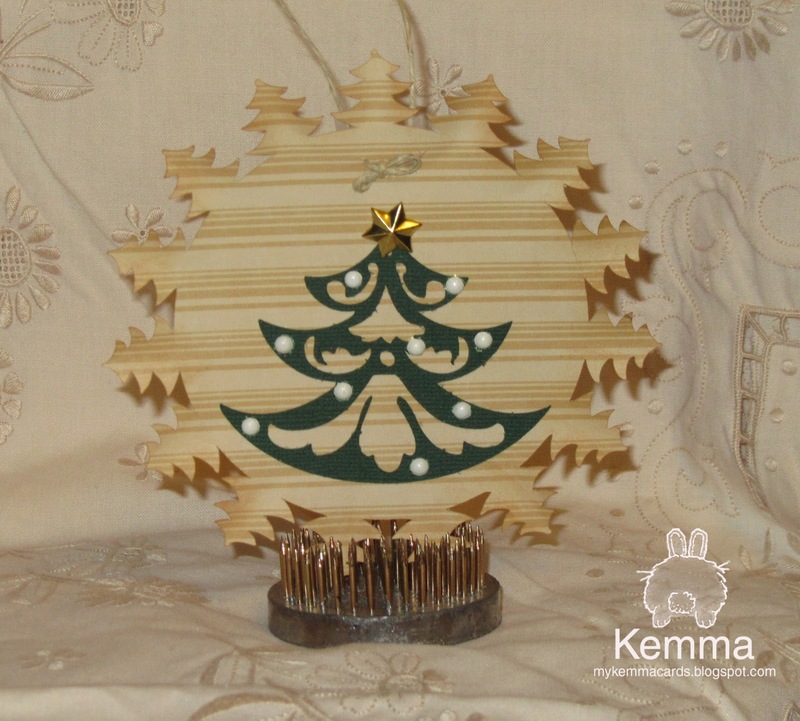 This one is really simple with just the shape and shadow cut. I decided to make my own face with some stamps I had. And this is a sweet little card that I made for Sean, I forgot to take a photo to show where the monster opens up! Isn't he just fun? Don't have a gypsy and can't do the welding to make shaped cards? 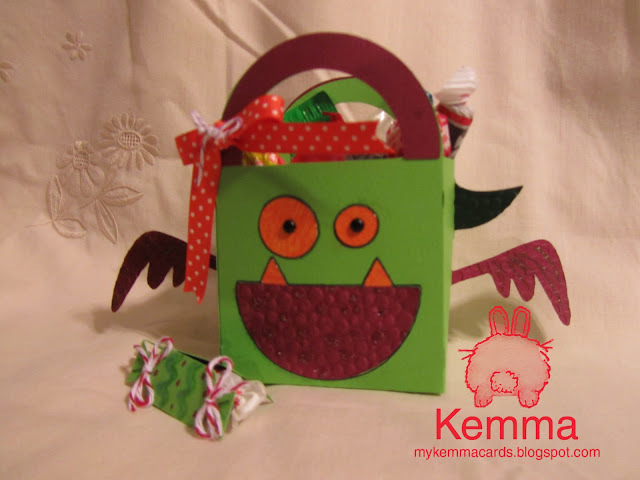 You are in luck with this cartridge, many of the monsters have already creates folding shaped cards! 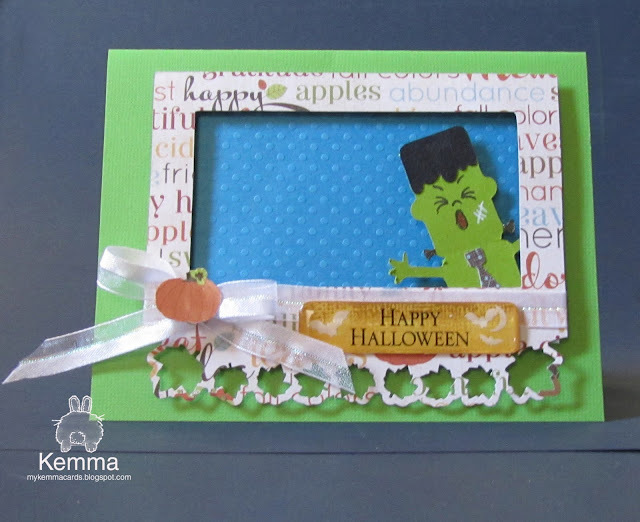 Another idea is a window card, see how Frankie looks like he is peeking out a window? This effect is very simple to do. You can take any open shape, and raise it with pop dots, which gives a window-feel to the design. So, what else can you do with this cartridge? 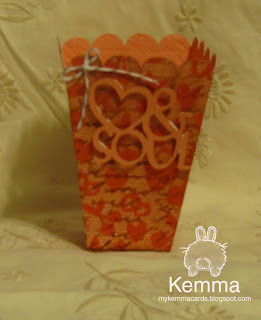 How about making a few little candy wrappers? 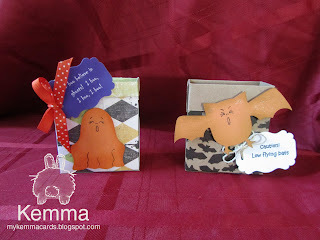 For these I cut out the card feature, but made them very small. The little pumpkin is cut at 1.5 inches and the little candy piece is cut at 2 inches. I just added a little twine and a few embellishments with some sparkle markers. So, after I got most of what I thought I would like for the embellishments, then I assembled the little bag. 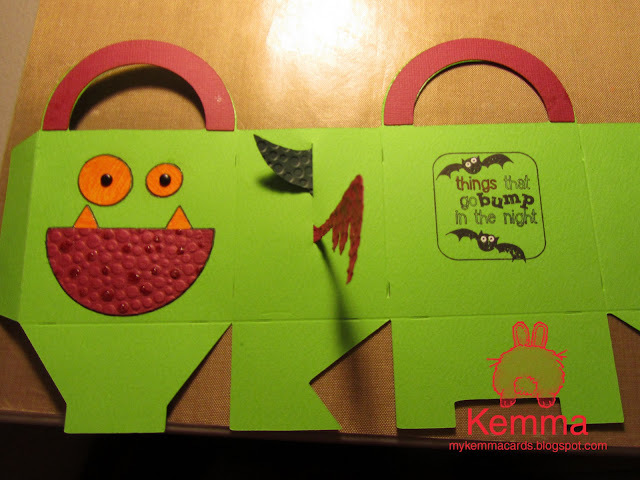 An that is just a little of what you can do with the Mini Monsters Cricut Cartridge! My Creative Time's FIRST Design Team Call! How exciting to be able to submit a project for My Creative Times' Design Team call! At the bottom under my supply list is a quote from My Creative Times with the info. It would be terrific to work with the great talent of Emma and her team. I am having a lot of fun as a member of the Cooking with Cricut Design team, which is not a sentiment based stamp company. They are really a great bunch of folks and I enjoy every moment. I would really appreciate an opportunity to design for My Creative Times. There are so many different projects I would love to create to submit for this, so many choices on what to do. I wish I had some of My Creative Time's stamps, there are several sets that interest me. Since I don't have any, I thought I would find something I have that is close to the ones that My Creative Time's offers, and I have to say I do not have many that can even compare. The one I chose, I think, is at least close, and thought it was really nicely themed with the card idea and layout I planned. I hope you all like it! 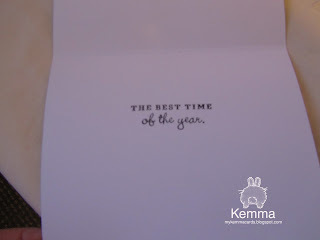 I created the snowflake paper by embossing on white card stock, with white snowflakes randomly stamped all over. Then I used several Ranger inks in shades of blue and inked the card stock. I think it really turned out nicely. I created my lovely snow lady with my Cricut Expression 2 machine. I used my alcohol markers to put a subtle shading on the left side of the snow lady. I distressed the hat and scarf and then added a little sparkle with the gelly roll pen. She is raised with pop dots. 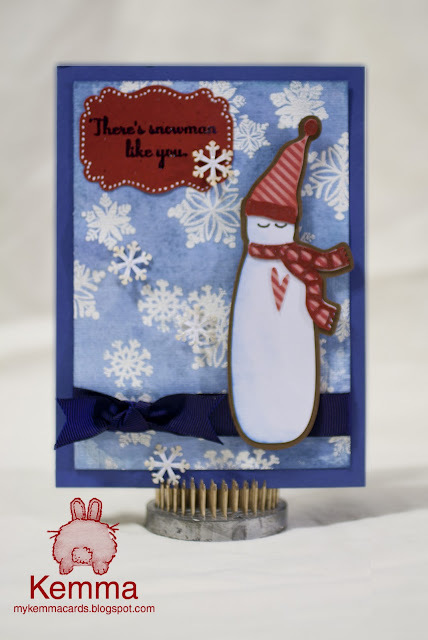 My sentiment is stamped and embossed in navy and then decorated with little dots around the edge with my white Galaxy marker. I used a punch I had for the shape. I added a ribbon with a knot and then used an old snowflake punch I had to make a few snowflakes, which I distressed with a faint color and then used small zots to pop them up. And though I WISH I could have each and every one of you on my Design Team - that would be A LOT of members to keep track of (and I already have 3 boys to keep track of at home. Yes, that includes my DH)! 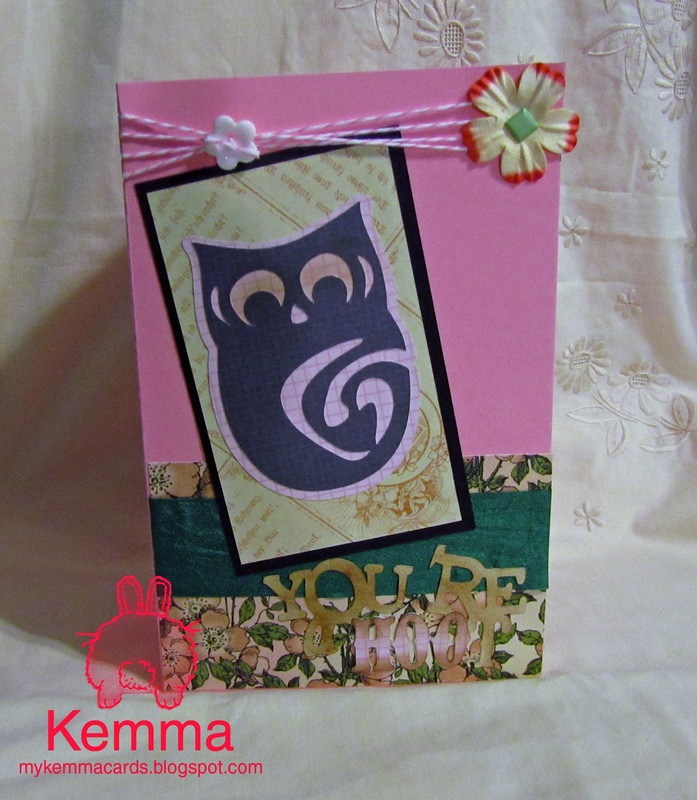 Therefore, I have to choose a select few to showcase my stamp line and really bring out its best features. Because of this, I'm requesting that should you be chosen as a member of my DT, you not join or currently be serving as a Design Team member for any other "Sentiment-Based" stamp companies during your term. Thanks so much for understanding! Also, you would need to have a blog to participate! Please create ONE project for this call. 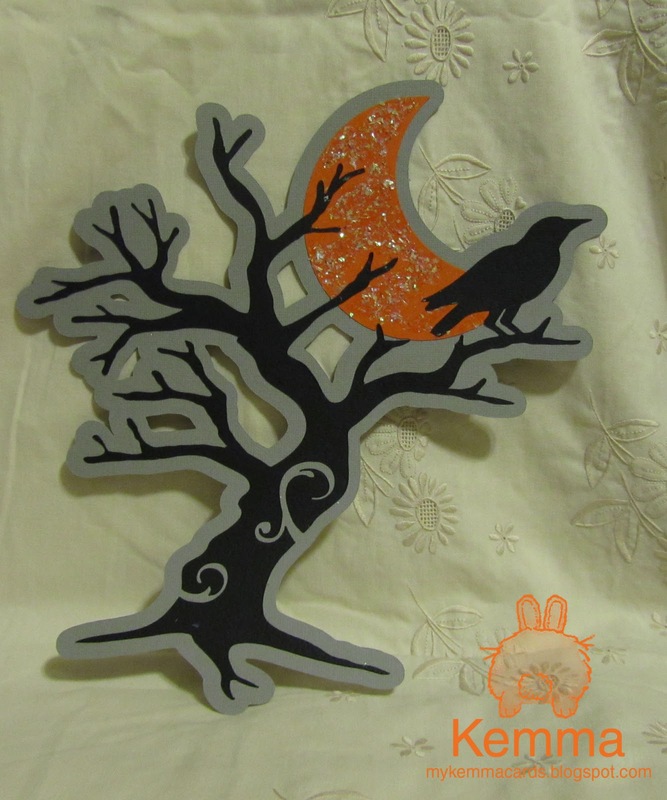 It can either be a card, layout, home decor item or a 3-D item! It would be nice to see my stamps used in your projects, but if you do NOT own any, please feel free to use what you have! It would be a 3 month term, you will be required to do 1 to 2 blog hops a month & complete approx 8 (this is including sneak peek week) projects a month! The deadline is Saturday, October 29th @ midnight to link your project up below! I will announce my new DT on Friday, Nov 4th! GOOD LUCK MY SWEET CREATIVE FRIENDS! I made two versions of this project, not sure which one I like best. 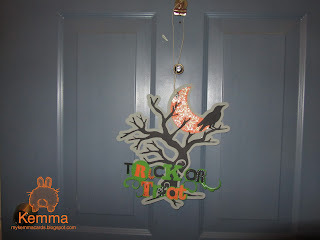 and here it is hanging on my front door!! This one was made entirely with the Celebrate with Flourish Cricut Cartridge, the largest I could get it to fit on a 12x12 paper. I tried to see if I could get it larger and use my 12x24 mat, but the design is pretty square so this was as large as I could really make it without changing the ratio. I used mostly Bazzill Basics paper. Decorated the words with my twinklette and atyouSpica markers, and used a white gel pen and my glittery gelly roll clear star pen. I assembled the entire thing with my zig 2 way glue. This is my new favorite glue! I decorated the moon with Stampendous Shaved Ice. It really looks more glittery in person than the photo can show. 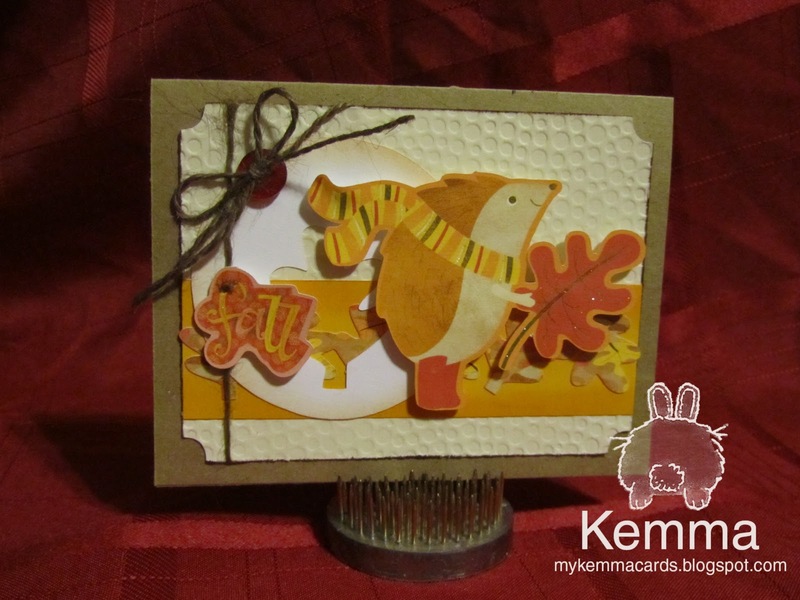 I really enjoyed making this card. I started with the sketch, got an idea and found a wonderful digi-stamp at papercraftingworld.com and then worked the rest around it. My recipe starts with the Just Because Cards for the large scalloped background cut from Life of the Party by Basic Grey paper, and distressed around the edges with Tea Dye Ranger distress ink. I have several types of ribbon from Really Reasonable Ribbons and used those for the three strips under the image. For the square, I grabbed a piece from my scrap bin, and inked the edges of it with Vintage Photo Ranger distress ink. 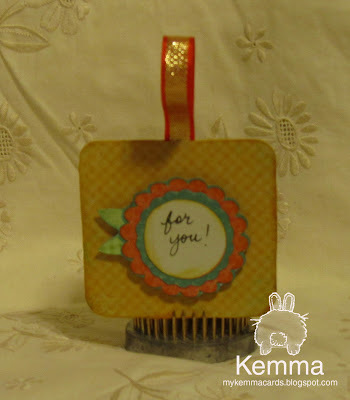 I used Cricut Essentials for the little sentiment tag, stamped it with a stamp from JoAnns, and embossed it with Zing Metallic embossing powder. For the focal point of the card, I used the Indiana Jones kitty from Paper Crafting World, and printed it on my printer on matte photo paper. 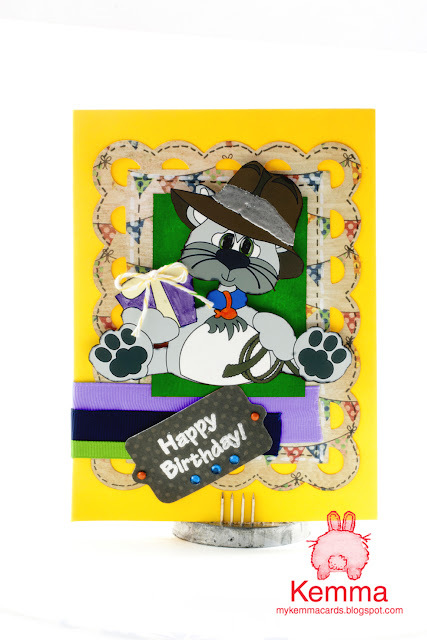 I embossed the band of the hat with the same metallic embossing power and then colored the blue on the gift with Wet Looks embossing markers and used Ranger superfine clear embossing powder over it. I used some twine and made a bow and adhered it with a Zots. I then trimmed all around the cat as best I could and then went around the edge with a black marker. To really make the cat the focal point of the card I used a bunch of pop dots to raise it up. So my office has now had half of it taken over for paper crafts. Mind you, I have a full bedroom upstairs that is my Sewing Room with half of that taken with basket making and a general table, but I found myself not having enough space, so have now taken up the entire wall downstairs too. Oh and my floor loom sits here in the family room too, will have to get a few strapping strong men to help carry that baby upstairs so I have a place for the Christmas Tree! 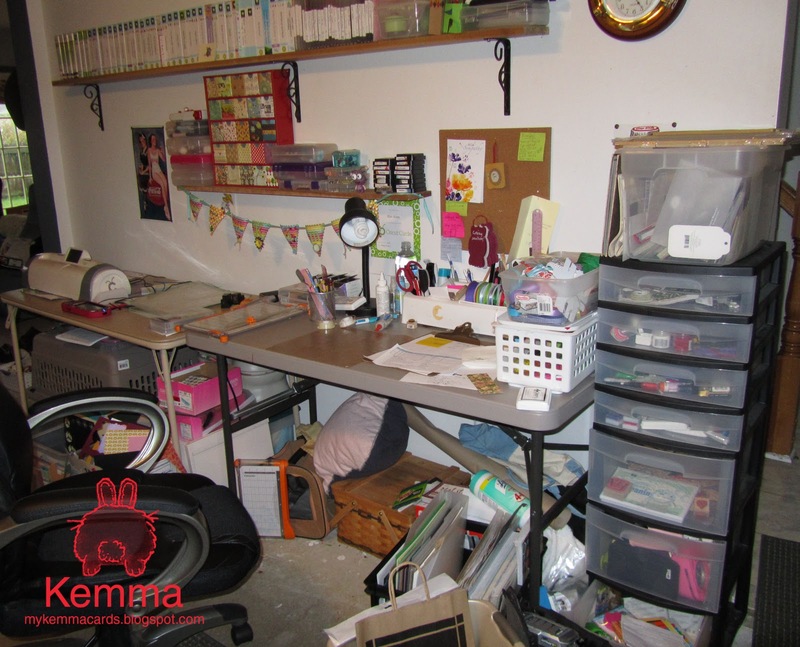 Well, as part of my crafting journey, I decided to periodically take a snapshot of my craft place. We will see how it evolves over time. Right now I am missing one machine, my Imagine is sent back for repair. The cut for this month is an "owl" cut, you can use any "owl" from any Cricut cart that you want, svg files are fine too. You must use the word "hoo" in your sentiment. 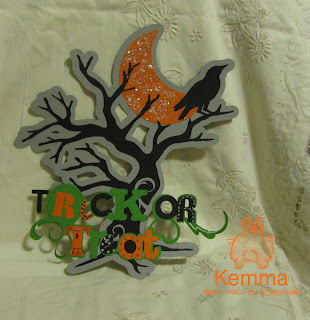 If you got here from the Cricut Circle November Magazine Challenge, I messed up on the link. 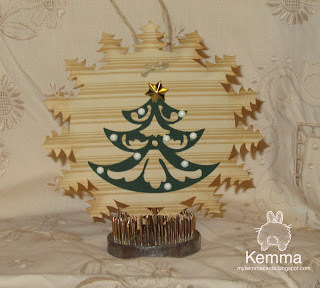 Cricut Circle Weekly Challenge #43: Feeling Gifty Challenge! 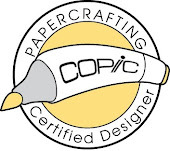 I am so excited to announce that I have been selected for the Cooking with Cricut design team! I look forward to working with everyone. 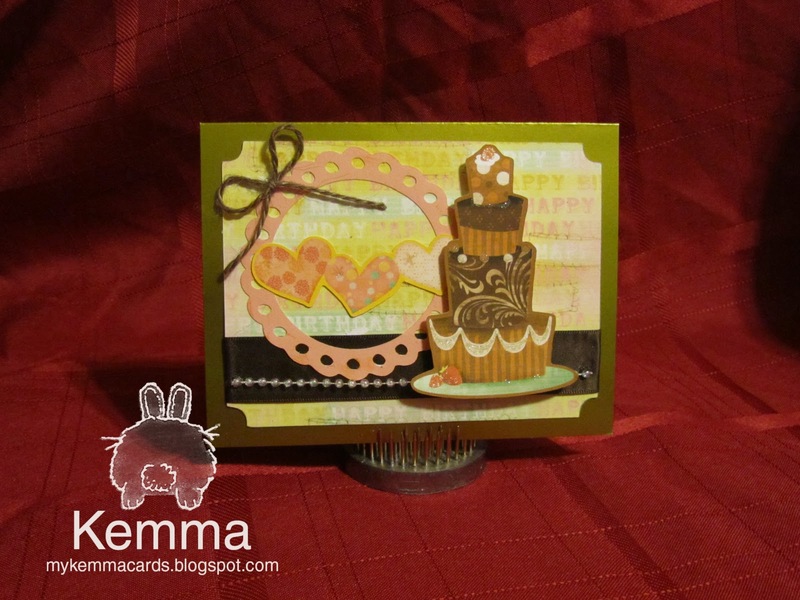 Here is my card for Challenge #55, teddy bear, cake or cupcake. 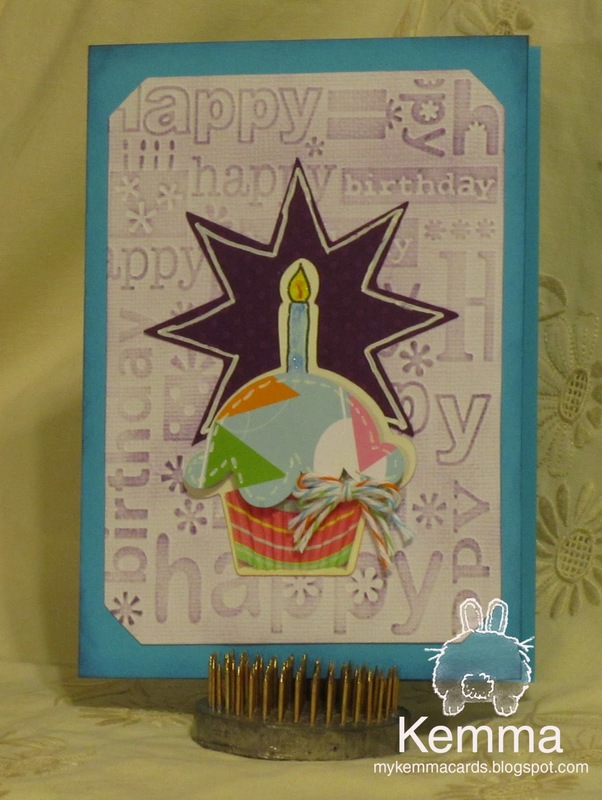 For this one I used a Bazzill Basics white card stock and embossed it with the Cuttlebug birthday folder. 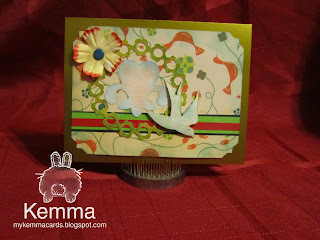 I then used Dusty Concord Distress ink and lightly rubbed it over the embossing to pick it up. I used Gypsy Wanderings cart for the star using some scrap paper I had, and drew a white line with a gel pen. I then used Best of 2006 (which this cut is also on Doodlecharms) for the cupcake using more scrap paper. 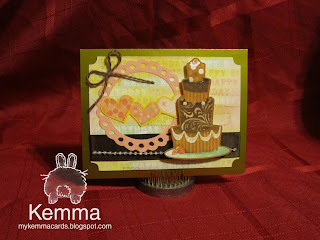 For fun, I had some mini cupcake liners that happened to go along with the color theme I was doing and cut one out for the liner on this cupcake! I added stitching with the white gel pen and then colored in the candle with twinklette markers. I took three strands of Really Reasonable Ribbon's twine and tied a bow, using colors from the cupcake. I hope you like it! I used my script cuttlebug folder on the entire 3d box. I then used Vintage Photo Ranger Distress ink From the Best of 2007 cart. The sentiment is from Spring Holiday. I reversed the image and cut this all from one 2 sided sheet of cardstock I have had forever. I added a little twine bow. 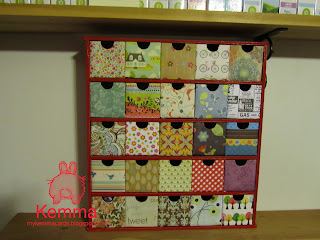 The Challenge: Create a project of your choice using your Cuttlebug machine as the main focus. Your project must include atleast 2 different Cricut Image Cuts. This one also qualifies as the monochromatic one! 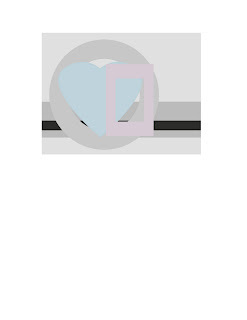 The Challenge: Create a project of your choice using a monochromatic color scheme. Your project must include atleast 2 different Cricut Image Cuts. BLOGIVERSARY CHALLENGE: Exclusive Circle Cartridge Challenge! 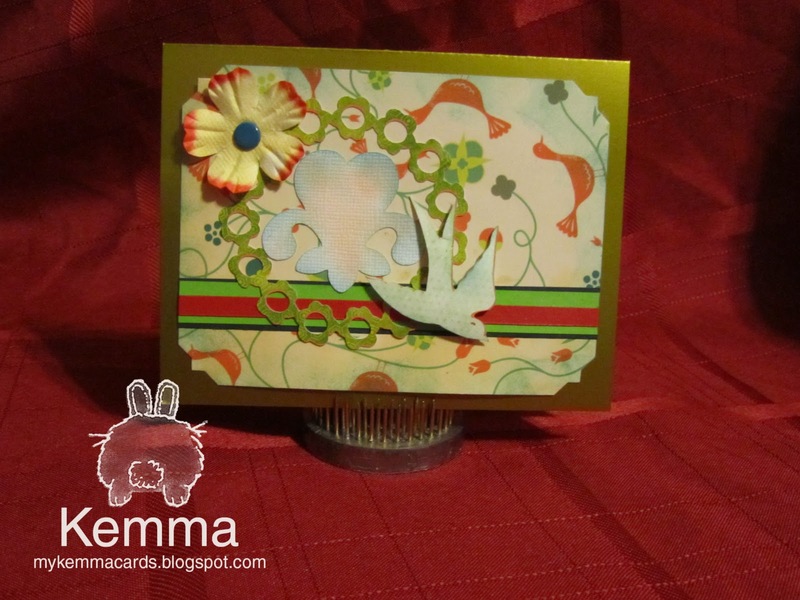 Cut the doily at 5"
BLOGIVERSARY CHALLENGE: Imagine Layer & Print Challenge! Taking the square shape that comes with the machine, I filled it with a pattern. I chose a design and then chose to print and cut all the layers except the sentiment. I print and cut it, and for some reason the design seems to have cut lined up ok, but then went it went to the second row to cut the square, it was off. I trimmed it up with scissors. I inked all the edges with Ranger distress inks. To make the tag, then I taped a ribbon loop in between the two back to back square layers, and then put the design layers together. I changed the sentiment to say "for you" written in a black twinklette marker I have. I then put the design on the square with pop dots to give it some dimension. Not bad for my first real Imagine project! The WINNER of this challenge will receive a Cricut Cake Machine! 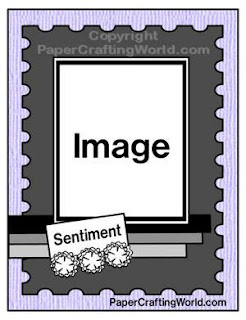 The Challenge: Use your Imagine Machine to print a background (it can be a solid color or a patterned paper from your Imagine cartridge) and use it on your project as well as cutting an image of your choice in layers- that’s right, choose the layers option on your image and print out one or all of the layers offered, piece them together on your project! Rules and Guidelines: Circle Blog Challenges are open to Cricut Circle Members only. 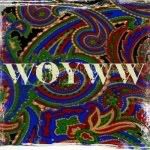 You can create any type of project you would like (tag, altered project, mini album, etc.) but your project must be newly created for this challenge. You must submit a project to be entered into the Challenge Prize Drawing. Weekly Challenge #42: World Card-Making Day Challenge! 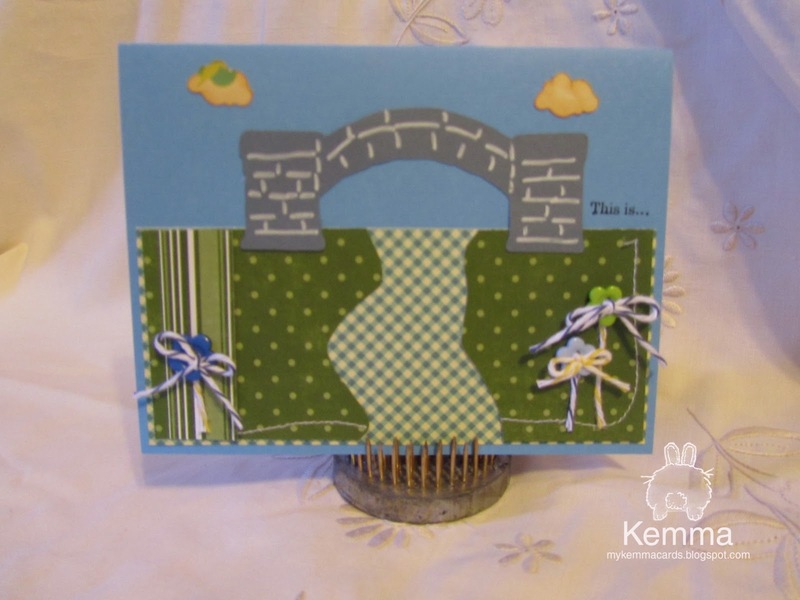 The Challenge: For this next challenge, we want to see you show off your card-making skills in honor of World Card-Making Day (October 1st). The requirements are simple . . . create a card with any theme you would like using your Cricut machines! Tiny Treasure Box project- Finished! 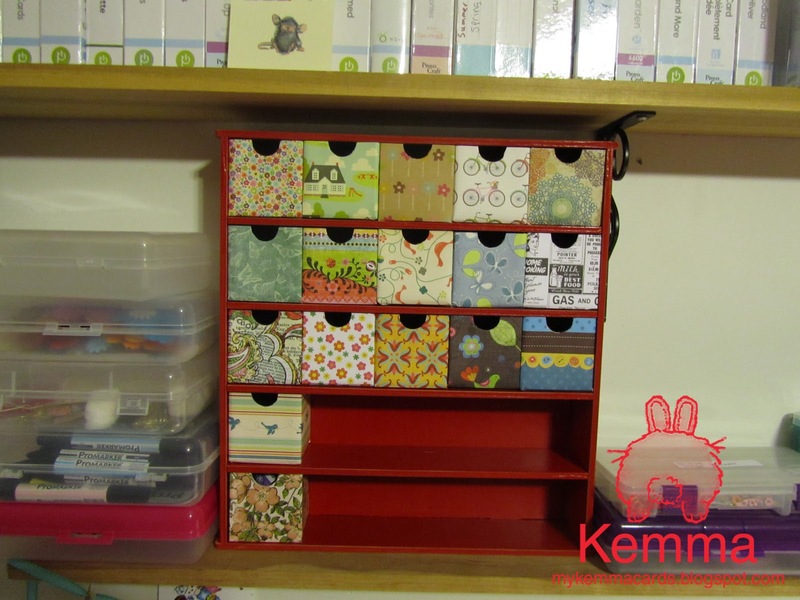 I found this lovely treasure box called Kaisercraft Beyond The Page Treasure Chest With 25 Chipboard Drawers that I thought looked like a lot of fun to create. 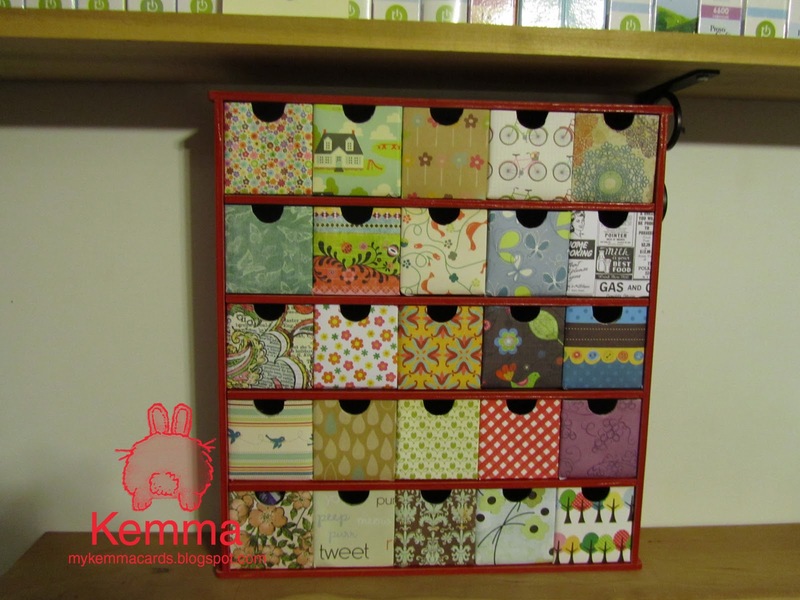 It comes totally unassembled, and unpainted with chipboard drawers you also have to assemble. I should have taken a photo of it out of the package but didnt think about that. Here is where I started painting the pieces. You definitely want to do this BEFORE assembly, its much easier to get the paint on a flat surface than when its put together. I used acrylic paint, since this is MDF board, and it took 3 coats to really get it to look smooth. There are a few more pieces than what is shown here. But you get the idea. So next I decided I wanted a more distressed type of look to the base. So after allowing the last coat to dry 24 hours (and I think 48 would have been better) I took a rough sanding block, and distressed the edges. I did this over the trash can it produces a lot of dust. You can sort of see there in the photo the part closer to me has the color removed from the edges where the other half hasnt yet. This took quite a bit of sanding to get it to look the way I wanted it. Wipe off the boards with a damp cloth to get the rest of the dust off. Here are all the pieces sanded. Another thing I learned, see the slots there that pieces will be fitting in to? Weeelllll dont get paint in there if you can or use a qtip and wipe it out when painting. The paint dries in there and then you have to get an exacto knife and cut it out to make the pieces fit together. I dry fit (with no glue) the entire thing first, which I highly recommend doing, as apparently there is a front and a back to the side boards and it will fit either way but for it to go together right you have to have the slots right. 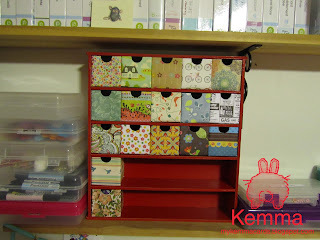 You can also see in the back of this photo where I am assembling the little drawers. They are a flat piece of chipboard and I decided to use masking tape to put them together since I am covering the drawers with paper. On the long side, score at 2 7/8. Make sure you pay attention to your design on your paper. Then score at 1/2, 3 1/8, 5 7/8, 8 1/2, and 11 1/4. on the bottom below the long score, snip at the scores a little v, this will help fold them under at the bottom. Here is the drawer wrapped. Now for the bottom. Then take a 2 1/2 inch square and tape it over the bottom. Now we have to deal with the notch. Take your exacto knife and very slowly go along the edge. And there we have a finished drawer! Now to just do the rest! I will post another photo when it is all done. Dont need two sided heavy card stock, the best drawer was regular paper weight paper.